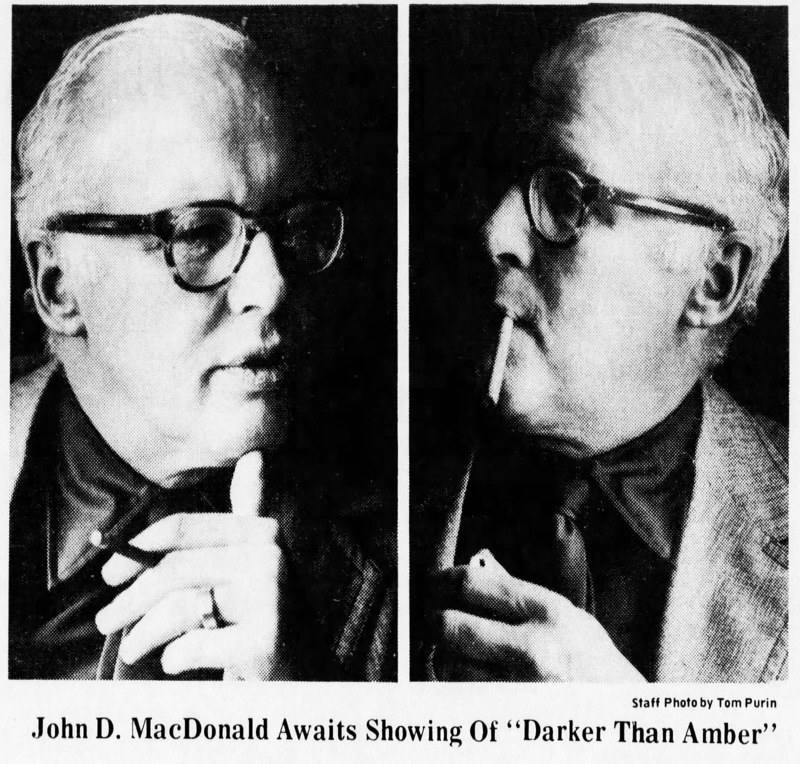 In August of 1970, two days prior to the public release of the film version of John D MacDonald’s 1966 Travis McGee novel Darker Than Amber, a private screening for VIP’s and selected members of the local press was held in Miami. The affair was hosted by the film’s producer Jack Reeves and he invited MacDonald, MacDonald’s wife Dorothy, and the film’s star Rod Taylor. The MacDonalds made it, Taylor didn’t: a week before the event he was injured in an automobile accident in California and his doctor would not consent to him traveling. This article appeared in the August 13 edition of the Palm Beach Post and was written by staff reporter Dave Simms, who attended. The few bits of opinion JDM offered on the quality of the finished product are -- given the circumstances -- kind but vague, and in stark contrast to those he voiced later on. His shoulders draped in the beginnings of what appears to be, incongruous for a writer, a business suit, sliced at heart-top by the crop of the photograph. So I'm walking through the tubular maze of hallways in Miami's squatty, pink Wometco Building, the image of the MacDonald photograph in my mind imaging Travis McGee and his hairy companion, Meyer, walking the same corridors, getting step by step closer to the private screening room. It's the room where John D MacDonald awaits, in the VIP row in back, the pre-public showing of his first Travis McGee book to be made into a movie. I expect a pipe with some burly aroma steaming from its bowl. And, despite the summer Florida heat and the business suit in the image, I expect a jacket of tweed. But John D MacDonald is sitting there in a pencil-point-gray, pencil-point-thin jacket over a blue-black, carbon-paper-colored shirt. And he's chain smoking little brown cigars. The projectionists is late and the pre-public showing of Darker Than Amber is delayed 15 minutes, a half hour, a few minutes more. MacDonald is murmuring in outwardly relaxed conversation about politics, youth, movie contracts and columnist John Keasler. The clothes and the conversation feign nonchalance. But the rapid succession of little brown cigars, impulsively extracted from a package-box, suggests a different mood. I don't think it would be too unwarranted to speculate that John D MacDonald is a bit apprehensive, flutteringly expectant and maybe downright nervous. "We're awfully sorry about the projectionist," says a man, obviously used to coordinating things, who's been darting around coordinating the long wait. John D MacDonald is done murmuring. "I loved the book," he chants with good-natured sarcasm. Creator of Travis McGee in 1964 (he's written a dozen McGee books since then), creator of mathematical-minded Meyer at the same time to travel South Florida, Mexico, elsewhere with McGee, the two quite probably MacDonald's alter egos, the writer is becoming good-naturedly impatient at the delay of their movie debut. Lights down finally, screen ablaze with opening scene headlights. And credits. John D MacDonald gets almost a full screen of credit. And Darker Than Amber is rolling. Travis McGee, the human hero National General Pictures hopes will become a household word for movie-goers, the human hero MacDonald readers already have made into a household word, is on the screen. But more about the movie itself, which was shot in South Florida, after it opens publicly Friday. Movie over, lights up. John D MacDonald pops up from his VIP chair. "Well, back to glaring reality," he says with conviction. I ask, in comment form, "It seemed to me he leered once. I can't imagine Travis McGee ever leering." "No," says MacDonald with a hearty laugh this time. "He smirked, maybe." The whole movie? "I liked it better than I expected I would," he says, bunched up with some others at the entrance to the dining room of the M-S Sunward, the cruise ship on which part of the movie was shot and to which the private screening party is bused for lunch. He indicates he liked it much better than Cape Fear, a movie made a decade ago, in pre-McGee days, from the MacDonald-written The Executioners. But he says, "I'm a grown up boy... enough so I realize that if you translate a book into a movie accurately, the movie would take eight hours to run and nobody would stay." MacDonald's wife says he was unhappy with the first Hollywood draft of the screenplay, but it apparently improved along the way. John D MacDonald ponders a restaurant scene in the movie that isn't in the book. "I thought those two buddies of that kid in the bar were quite chicken." If he had written a similar sequence into a book, he would have written it differently. He muses over something else and suddenly says in a gee-whiz kind of innocent tone, "You'd think they had to raid a blood-bank to get the blood for the picture." He's laughing now a bit and people are shuffling around John D MacDonald, trying to impress him with how many of his books they've read and how much they know about Travis McGee. I get the feeling John D MacDonald is not the type of writer who gets impressed with that kind of tactic. But he bends a bit today, after the screening, to be especially gracious and polite about it. Because, for John D MacDonald, Travis McGee, after six years in paperback, is now alive and well on the movie screen.